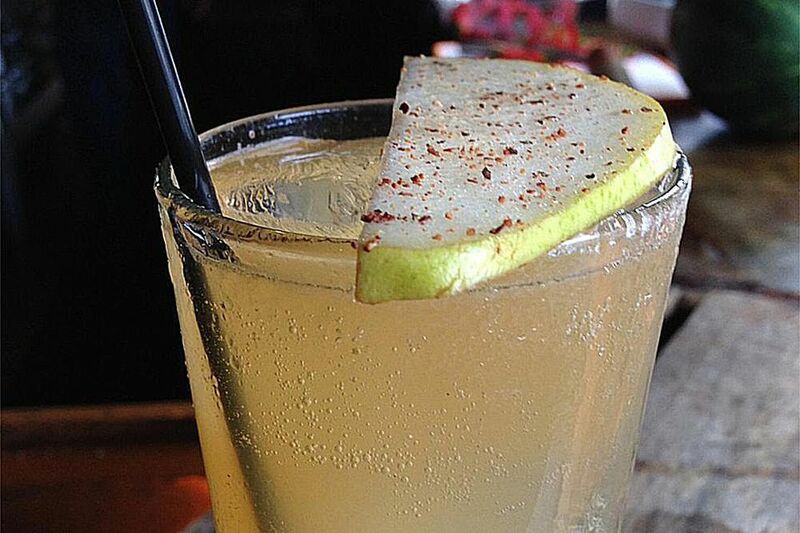 This tasty pear naked sailor cocktail comes from Jonny Cimone, bar manager at Farmer Brown in San Francisco. The restaurant specializes "San Francisco soul food" using mostly local, organic, and seasonal ingredients and the cocktail menu follows suit. This drink is a fantastic mix of fresh flavors that are natural companions. It begins with spiced rum—Sailor Jerry is recommended and plays perfectly to the cocktail's fun name. That is complemented by the pear puree and homemade ginger nectar. The drink is topped off with bitters and ginger ale to create a flawlessly balanced cocktail that's sure to get noticed. The ginger nectar is easy to make yourself and can be as spicy or tame as you like. You can use as much ginger root as you like, and the amount of water needed will vary accordingly. Keep in mind that it does need to steep overnight, but it is a great ingredient to have in the bar so it is worth the little bit of effort it requires. Using fresh ginger, peel thoroughly then slice into 1-inch chunks. Spread onto a sheet and bake in the oven at 350 F for 15 minutes. Place the ginger pieces into a storage container and add four times its volume of hot water. Let it steep overnight. The next day, scoop the ginger pieces into a blender along with some of the gingered water. Reserve the remaining water. Blend at a high setting until the ginger has been broken down and liquefied as much as possible. Fine strain multiple times using a muddler to press every last drop of liquid from the ginger. Add more of the gingered water to taste in order to regulate the level of spice. Strain over fresh ice into a collins glass. Float the ginger ale on top by pouring it slowly over the back of a bar spoon. Garnish with half a pear slice and a dusting of nutmeg. A perfect complement to the drink, replace Angostura's Aromatic Bitters with pear bitters. Look for it from brands like Dillon's Distillers and Workhorse Rye. If you prefer a slightly drier cocktail, switch from ginger ale to club soda or tonic water. How Strong Is a Pear Naked Sailor? Not only is it packed with flavor, but Sailor Jerry is also a potent rum that's bottled at 92 proof, so it's definitely not going to get lost in this recipe. However, it's the only liquor in the highball, which means its surprisingly low-proof. On average, you can expect it to have an alcohol content somewhere around 10 percent ABV (20 proof). It's a lot like a glass of wine, only far more flavorful!